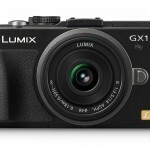 The new Panasonic Lumix GX1 appears to be the beginning of a new line of high-end compact Micro Four Thirds cameras. The GX1 offers serious camera performance in a traditionally-styled compact, interchangeable lens camera. The 12-megapixel GF3, announced in June, was designed for casual photographers who want to step up to the better quality of a compact system camera. The new GX1 is designed to address the needs and wants of serious photographers who want a smaller, interchangeable lens camera. It gets the GF3′s touchscreen LCD display and improved auto focus but in a more traditional camera body with a higher-resolution 16-megapixel sensor, customizable controls, mode dial, flash / accessory hot shoe, electronic level, and ISO 12,800 sensitivity. There’s also a new optional 1.4-million-dot resolution electronic viewfinder (DMW-LVF2) that can be mounted on the GX1′s hot shoe. 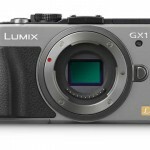 The Panasonic Lumix DMC-GX1 is supposed to be available in mid-December. 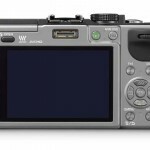 Suggested retail price for the GX1 body is US $699.99. 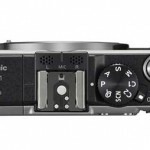 It will also be available with the standard 14-42mm kit zoom lens for $799.99; or with the new Lumix G X Vario PZ 14-42mm power zoom lens for $949.99. The GX1 will come in black and silver.